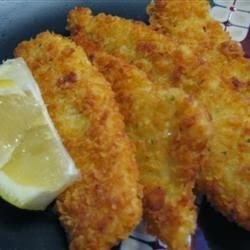 Even people who aren't sure if they love fish will love these crunchy fillets! Quick and easy! In a shallow dish, whisk together the egg, mustard, and salt; set aside. Place the potato flakes in another shallow dish. Dip fish fillets in the egg mixture. Dredge the fillets in the potato flakes, making sure to completely coat the fish. For extra crispy, dip into egg and potato flakes again. Fry fish fillets in oil for 3 to 4 minutes on each side, or until golden brown.